Remove the core of the sauerkraut head. Release the leaves and place them in a large bowl filled with cold water. Let soak for one hour. In them meantime prepare the filling. Chop the onions finely. Heat the ghee/oil in a heavy bottom pan and cook the onions until translucent. Add meat and spices. Saute them slowly until the meat change the color. Put about a 1-2 tablespoons meat mixture at the bottom of the leaf and roll up. . the meat amount varies depending on the size of the leaf. . repeat until all the meat is used up. Pour over the cabbage rolls with 1/2 cup of water. Cover with foil. . or the lid. 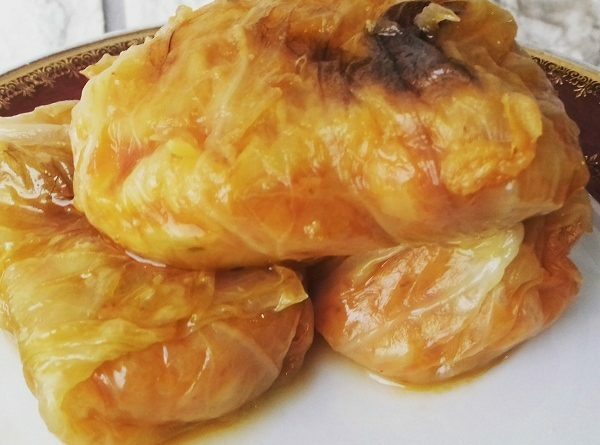 Bake the cabbage rolls slowly at 325 for 1 hour 10 minutes. Remove the foil and bake for 20 minutes more.